If you do the regular Annnapurna Circuit Trek you will not be doing this. You would be walking to high camp at 4800 meters after Letdar. However weather had other ideas for us. When I got up I could hear the rain, once again, before I saw it. Even though it was not snowing anymore it was raining hard. We decided to turn back, so did a lot of other people staying at the lodge. For me the trek was over now, all I wanted was to get out and go to Pokhara. However for that we needed to walk back. Remember there were jeeps at Chame? They suddenly became very attractive to me. So after breakfast we started walking back. 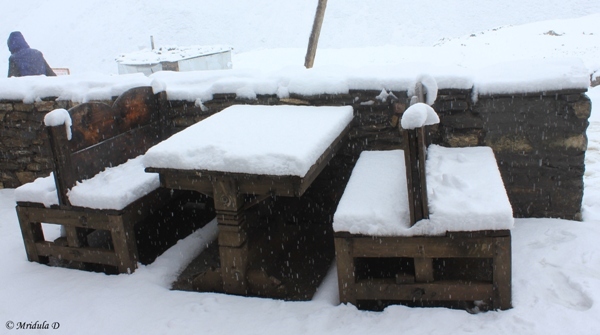 The plan was to have lunch at Manang and stay at Humde which is between Manang and Pissang. 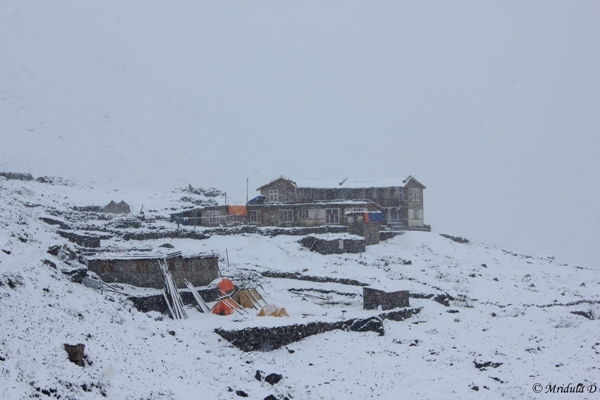 Humde has an airport at 11500 meters but it is used only by charter flights. So after breakfast we walked through snow but as there was only a little on the path, it did not pose much of a problem. Also going downhill is faster even for me if the way is not steep downhill. And this route was not. However, as we wanted to get out quickly now we were walking longer! These are the only two pictures I clicked on the route. It was raining so much that my precious (my camera) stayed inside my bag after this point. And even while going down, walking in the rain is a miserable experience. To top it up I wore socks which were below ankle length thinking that would prevent water seeping through the socks. But my new ankle high shoe left two deep gashes above my ankles even before I reached Manang. Injury wise it was not much but it was painful. However, limping and all I reached Manang in 20 minutes or so after getting the gashes. When Justin saw my injury he took out adhesive for me even without my asking. And Erick gave me his long socks. These small gestures at a time like this mean so much. We bought some adhesive as well. Once I applied it and had some food I was willing to walk again. And don’t even try to suggest that I did not break my new shoes. I did but on the city roads which had no rolling stones. 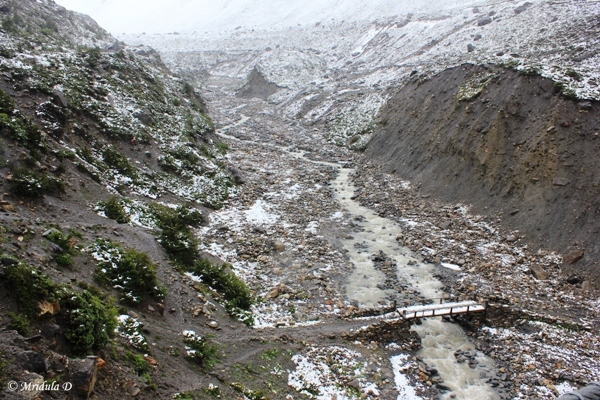 It was useless when I walked down in rain to Manang as almost every other stone moved and made my ankles twist and turn in all crazy ways. That is how I got the cuts and not because I forgot to break in my new shoes. 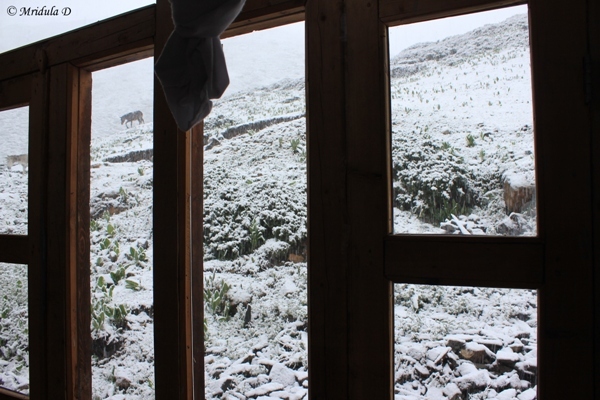 We had an adventure just outside Manang. Motorcycle tracks were long gone by now. At one point there was a swift stream flowing through the road. It was quite fast and Heera jumped across it somehow, leaping from stone to stone. There was no way I was even going to try that! So I took off my shoes and socks and waded through it with Hari and Heera’s help. They put big stones in it so that we could step on them and somehow get out. We got out, don’t ask me how, in the end. The rain was pouring all the while. I was going well for quite sometime after this. At one point we even talked about walking till Pissang. But just as we approached Humde I got cramps in my right leg, my first and only experience of cramps on trekking so far. I hobbled painfully as Hari went asking for place to stay at the lodges. He told me that most of the lodges were not ready (I don’t know why) to give a room. So I told him that we should go together and ask. There were three women at the next lodge and they welcomed me. I was so happy to find a roof over my head. I was not too tired, but the cramp made me really uneasy. It did ease out after a rest of 20 minutes. The bigger challenge now to was to dry the wet clothes as I had no more clean clothes to use for the next day. If I used the dry pair that I was wearing for trekking then I would have no dry clothes to change into, which is worse. So I told myself that I would walk in the semi-dried clothes and keep one pair completely dry rather than get everything wet. When I went down to the dining hall, the lady of the house invited me to their kitchen as there was a fire going on. It was a complete privilege. It had been raining for the last 4 days and the kitchen had buckets placed in strategic corners to collect the rainwater from the leaking roof. There were repairs done with polythene patches but it was also such a warm place and not just because of the fire. The owner of the house was saying his evening prayers (Buddhist) in the kitchen and would chat with me in English in between as well. They offered me tea. Later they said I could take my meal in the kitchen itself. By now I stopped writing my diary. I actually stopped at the day it snowed at Letdar itself. There were neighbors who kept coming and going inside the kitchen. I could not understand much of the conversation but it had a lot to do with the weather and the rains. I asked Hari what did they say about jeeps at Chame. He said the roads were no longer functional at Chame and there were no jeeps. 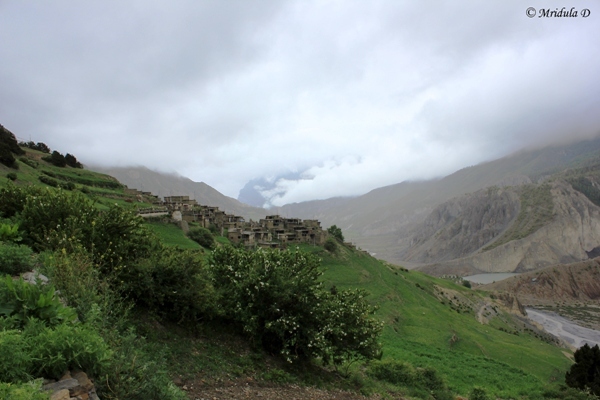 If I had to walk up to Beshishahar I might even miss my flight to India, it was so far away! But no one knew for sure, we had to walk and see. When we asked about the motorcycle tracks they said just outside Humde the roads were cut and water was flowing on the road! So no motorcycles either. After dinner I had to go to sleep as there was no power supply at Humde due to the rains. Sleep anyway came quickly as I was tired. The question was would I get the jeeps at Chame or would it turn out to be a long walk to Beshishahar? At least at Chame I would get to call home. I was already late by a day and I knew folks back home would have been worried. 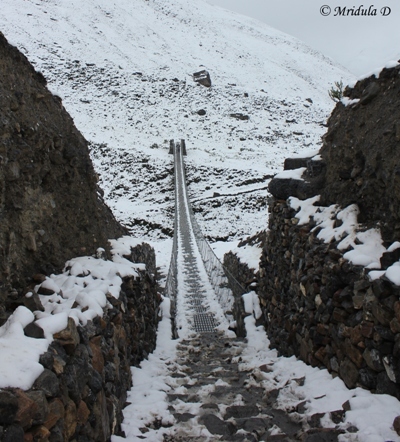 The next day we were surely walking to Chame and if there were no jeeps, then up to Timang or Danaque. Oh! and did I say it took me 11 rain soaked hours (breaks for lunch and tea included) to walk from Letdar to Humde? 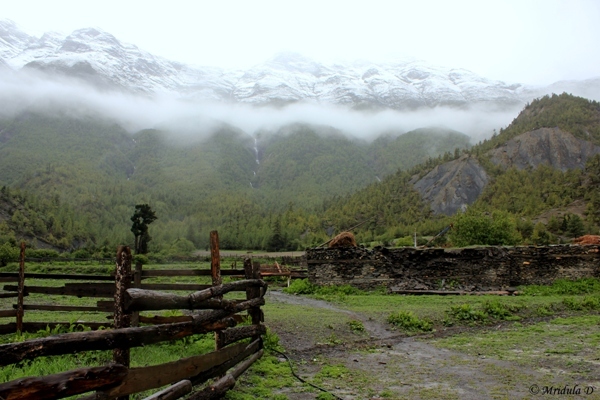 As it was raining when I went to sleep, I wondered if walking from Manang to Letdar would be in pouring rain. When I got up I could hear the rain before I could see it. But when you have to go you have to go! So I got out and went about having an early breakfast and started out in rain. 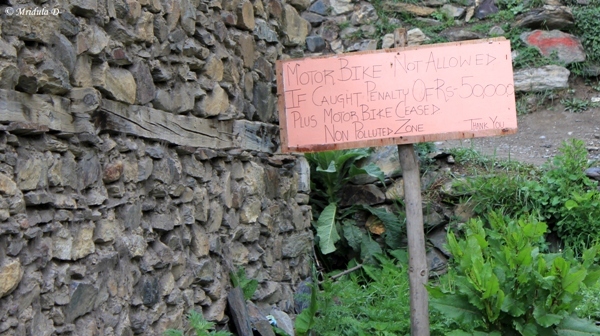 As we started walking out of Manang I came across this no motorcycle notice. As of now it was raining mildly so I still kept my camera out. My rucksack was not waterproof so everything was packed inside polythene (I brought back everything and they will be reused). It worked as I would have one dry change of dress when I would reach the next stop. For a while it rained mildly and I clicked a few pictures. 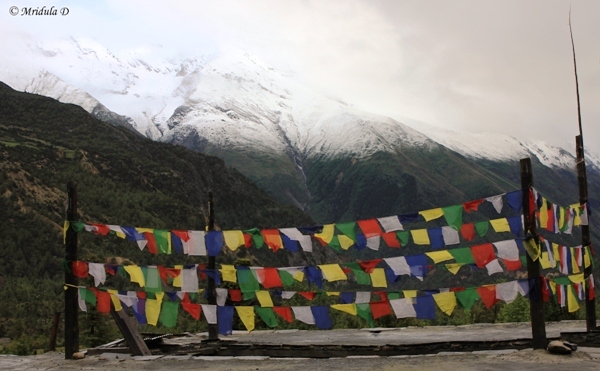 I got to see the Gangpurna Lake in the distance once again as we climbed up to Upper Manang. However I was already inside my Gandlaf without magic cloak (raincoat actually, have to post a icture) and handling the camera was not easy. Still what is a trek without clicking pictures, so I went on. 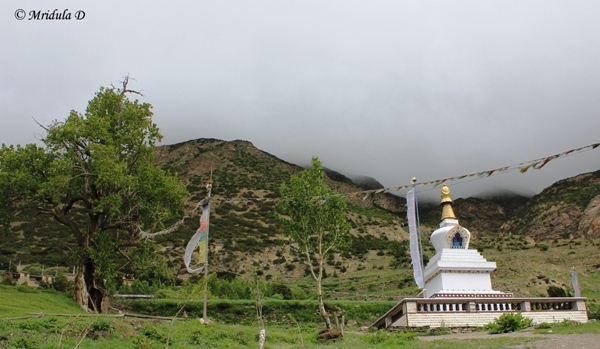 However by the time I reached this stupa it was raining so much that I had to put my camera in my backpack! I have already given a watery grave to my previous SLR at Havelock, I do not wish to repeat that performance ever! If you have ever trekked in the rain for the whole day you know how miserable it feels. If you have not trekked in the rain for the whole day you are lucky, I hope you never get to experience it. One hour, two hour of rain is a different matter but whole day in rain, I can do without it. But not so on this trek. 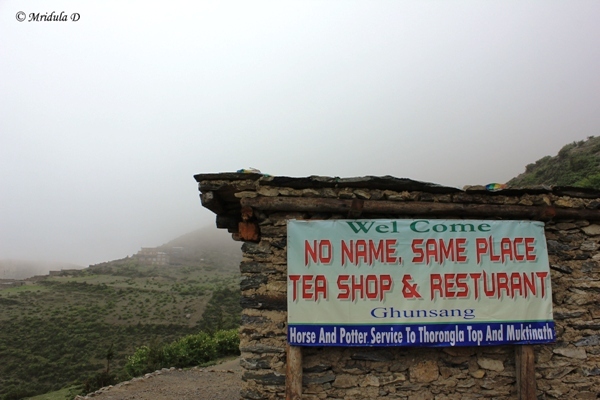 Thus walking in rain we reached to the ‘No Name, Same Place Tea Shop’ where we stopped for tea. It was a welcome break and an opportunity to get out of the rain and the cloak. I also took out my camera and took a picture of the shop with the unique name. This was the last picture I took on this particular walk. It rained so much that my camera never came out after this. Oh! and there is no Harry Potter anywhere, they mean to say horse and porter service available. After tea we reluctantly got out of the shop as it was still raining. After a while my water proof shoes were soaking wet because rain would trickle from the socks above my ankle. After an hour and half we stopped for lunch. By now rain had found a way to get into my clothes too. Luckily the lodge owners had put an an angithi below the dining table and it drew everyone around like a magnet. We tried unsuccessfully to dry our socks. Outside it rained unabated. Soon lunch was over as well but the rain continued and so did we. At one point it was raining so hard that we stood beneath a yellow barsati (plastic hanging out to form a shelter). After another hour or so I reached Letdar and managed to get out of my wet clothes. 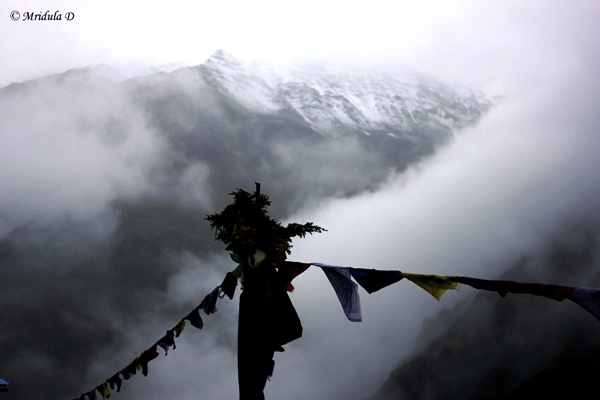 I was now at an altitude of 4200 meters as well and it was cold now. There was mist all around. And due to some reason the lodge at Letdar didn’t had a proper fire. It rained when I had tea and it still rained when I came down for dinner. I sincerely hoped that it would stop the next day. I did not wish to walk in rain for the whole day again. Little did I know what was in store for me actually! I fell asleep to the sound of rain as well! And if you are tired of reading about nothing but rain imagine how I tired I must have been after walking in it.